In the next release of the SAP Cloud Platform Extensibility Road Map for the 1808 release of SAP Cloud Platform, you will see “Integration of multiple SAP Cloud Platform subaccounts in one SAP SuccessFactors tenant” under Recent Innovations of the Extensibility foundation for SAP SuccessFactors solutions section. For those of you subscribed to the SAP Cloud Platform Extensibility Road Map, you may recall seeing this as a planned feature in the 2018Q2 release of the roadmap, pictured in Image 1 below. Due to space limitations of a slide, we can’t include much detail about what this recent innovation is actually providing. This blog is intended to provide more information about what we actually mean by “Integration of multiple SAP Cloud Platform subaccounts in one SAP SuccessFactors tenant”. In the 1805 release of SAP Cloud Platform, we released a change in our data model moving Integration Tokens from the global account entity to the subaccount entity. This ispo facto required a change in the administrative interface of SAP Cloud Platform i.e. the SAP Cloud Platform Cockpit, refer to Image 2 below. This change enabled us to make various cascading changes, and in the 1805 release we used this to change the existing process for the automated configuration of the extension integration between an SAP Cloud Platform subaccount and an SAP SuccessFactors company instance which creates what we refer to as an “extension account”. SAP Community blogger Manju Venkatesh has written a detailed blog about extension accounts on SAP Cloud Platform which answers what is the difference between global accounts and subaccounts, what is the relationship between subaccounts and extension accounts, how to perform the automated technical onboarding to create an extension account, and how to utilize the console commands available in the SAP Cloud Platform Neo Environment SDK to automate the configuration of an extension account. If you’ve built and administered SAP SuccessFactors extension applications on SAP Cloud Platform before, you would remember that in order to trigger the automated configuration of the extension integration you needed to perform the steps listed in Listing 1 below. Right from Step 1 in Listing 1 above, you can see the problem. If we’ve moved the Integration Token from the global account to the subaccount then the established process falls apart. We needed to change the process. Which we did and released in the 1805 release, refer to Listing 2 below. In fact, the functionality I discuss above is the same functionality that we described as “Convert existing SAP Cloud Platform subaccounts into extension accounts” under Recent Innovations in our 2018Q2 release of the SAP Cloud Platform Extensibility Road Map, refer to Image 2 below. With that background in place, we can finally get to the new feature in 1808. Having now the ability to convert a subaccount into an extension account opens up the opportunity to address more challenges that our users have been facing. The first challenge that we decided to tackle came from our bread and butter use case for SAP Cloud Platform: SAP partners building extension applications on the platform to sell to SAP customers. Bjoern Goerke has given SAP Cloud Platform the directive to be the “best extension platform for any SAP application“. To be the best extension platform, we need a thriving ecosystem of partners building extension applications as well as the infrastructure to make these applications available for purchase so that our customers have the choice to forego the cost of developing these capabilities themselves. Well, SAP Cloud Platform does have a rich ecosystem of partners. Particularly, it has a rich ecosystem of partners building extension applications for SAP SuccessFactors as can be seen by the numerous applications tagged with “SAP SuccessFactors” on the SAP App Center. Yet while our partners have been able to successfully build and deploy their extension applications on SAP Cloud Platform, there is still one issue that had plagued them for a while. In order to be the best extension platform for any SAP application, we needed to address this issue. When a customer purchases one of our partner’s extension applications, an integration between SAP Cloud Platform account(s) and the customer’s SAP SuccessFactors company instance(s) needs to be configured. I pluralize account and company instance because, typically, there are multiple accounts and instances to reflect the landscape of both partner and customer e.g. an account/company instance for development, an account/company instance for staging, and an account/company instance for production. Previously, for a customer who was purchasing an extension application for the first time this integration was not a problem. The partner who built the application could trigger the automated configuration of the extension integration between whichever SAP Cloud Platform global account will hold the extension application and the corresponding SAP SuccessFactors company instance, and the process of implementing the application could begin. But what if that same customer was so impressed by their new extension application that they went back to SAP App Center and purchased a second one? They would run into the issue that we alluded to above. The issue was that the pairing that the SAP Cloud Platform extension service established between an SAP Cloud Platform extension account and an SAP SuccessFactors instance was one-to-one. That is, once the global account had triggered the automated configuration of the extension integration and the extension account had been created that extension account was the only SAP Cloud Platform subaccount that could pair with the corresponding SAP SuccessFactors company instance. So during our fictitious customer’s implementation of their second extension application, the implementation team would quickly discover that they were unable to trigger the automated extension configuration to create an extension account to hold their application because one already existed. Instead, they would have to figure out a way to use the customer’s existing extension account. But say there were configurations in the existing extension account that were specific and necessary to run the first extension application that the customer bought e.g. configurations like a custom role, specific Trust settings, or a particular Destination? The new partner would possibly have no idea of these special configurations and any changes that they made could jeopardize the integrity of the first extension application. This paradigm essentially defeats the core tenant of side-by-side extensibility and bimodal IT to provide simultaneously a stable space and an innovative space. Our SAP Cloud Platform team had to do something. Well, we did. In 1808, we are releasing the ability to pair multiple SAP Cloud Platform subaccounts to a single SAP SuccessFactors company instance. This resolves the issue detailed above because it will be irrelevant whether a customer’s SAP SuccessFactors company instance has a pre-existing SAP Cloud Platform extension account integrated with it. The team implementing the extension application can simply create a subaccount in the customer’s SAP Cloud Platform global account, trigger the automated configuration of the extension integration which will configure that subaccount as an extension account for the designated SAP SuccessFactors company instance, and proceed with their implementation. Separation of concerns between the customer, the team who implemented the first extension application, and the team who are implementing the second extension application are restored at last! You might be thinking what does this look like? In Image 3, Image 4, and Image 5 below I provide pictorial representations of the “Integration of multiple SAP Cloud Platform subaccounts in one SAP SuccessFactors tenant” feature that I am discussing in this blog. 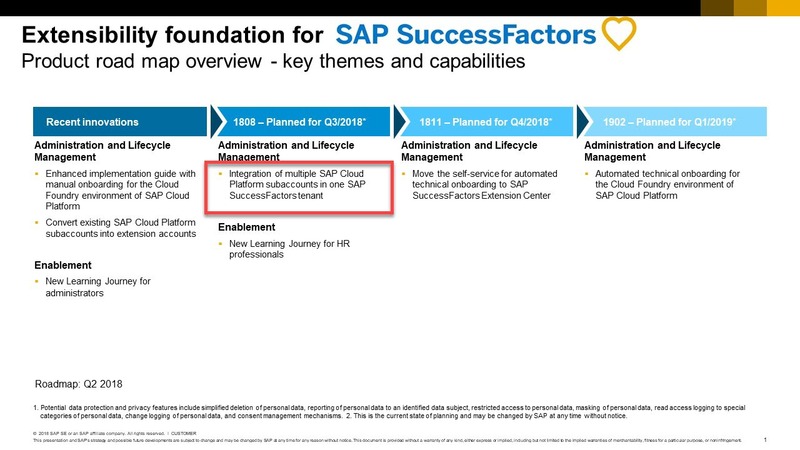 In Image 3 and Image 4 you see two SAP Cloud Platform subaccounts and in Image 5 you can see a single SAP SuccessFactors company instance that has been successfully integrated with both subaccounts. Both of these subaccounts are now individual extension accounts for this company instance. With this new ability, we can update the automated configuration of the extension integration that we saw in Listing 2. You can see this updated procedure in Listing 3 below which has an additional step where we utilize the integration of multiple SAP Cloud Platform subaccounts in one SAP SuccessFactors company instance. Why should you care about the 1808 release of SAP Cloud Platform? Let me preface this section by saying that there are many new features coming in the 1808 release of SAP Cloud Platform beyond the ones discussed in this blog. In this blog, I focus specifically on the features being released for the extensibility foundation for SAP SuccessFactors because that is my domain and you, the HR professionals, are my audience. You can refer to the comprehensive SAP Cloud Platform Road Map for more information about all of the new features in 1808. As a member of the HRIS team of an SAP Cloud Platform customer, you can more quickly and easily implement all the extension applications you desire! You also can choose the region of the data center in which the extension account exists. So if your company bought an extension application to provide a rewards and recognition system to employees in your German office and bought another extension application to facilitate changes in your organizational chart as a result of a merger happening at your Japan office, you can correspondingly have an extension account in Germany and an extension account in Japan both integrated with your SAP SuccessFactors system allowing your extension applications to run much more quickly in the regions where they are needed. 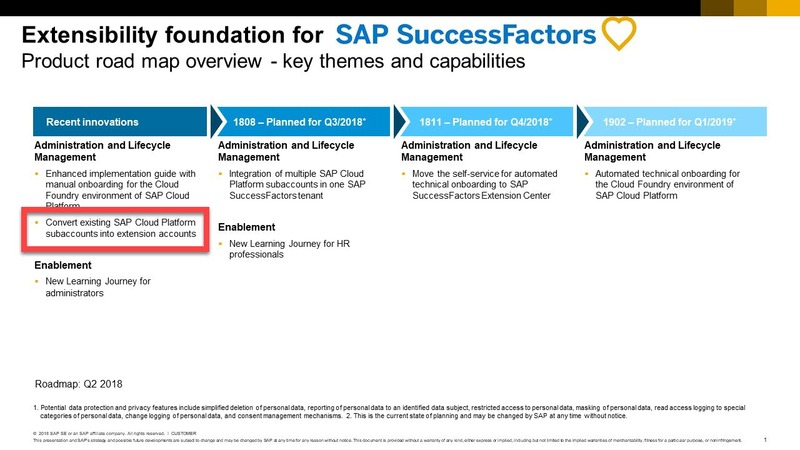 As an HR professional of an SAP Cloud Platform customer, you can start discovering and recommending extension applications to your SAP SuccessFactors system rest assured of a smoother implementation phase. If you are unsure what extension scenarios are possible and where to even begin, I’d recommend checking out a new customer adoption experience for SAP Cloud Platform provided by our team and built using the platform. As an SAP partner, the implementation of extension applications has just been made easier enabling you to satisfy demand more quickly and to take on more customers. Colin Kraczkowsky is on the Product Management team for SAP Cloud Platform. His domain expertise includes SAP SuccessFactors extension development on the platform. Colin’s professional history includes enablement and extension development for SAP’s analytic portfolio and front-end design and business development for a digital media startup in Washington, D.C. In his spare time, Colin likes to explore new areas, watch scary movies, try weird foods and participate in Turkey Trots. Colin is currently located in Palo Alto, California. Sounds like a lot of work went into that. I assume this means customers are going to have to manage multiple extension portals as well? I have always deployed any extension application to an “application sub account” and then subscribed to it from the extension account, thus avoiding any issues over who manages what. It does mean that when building the application one has to be aware of the implications of running in a multi-tenant environment, but that should be table stakes for cloud development these days. But always good to see further development in this space. Nice blog! I was wondering what would happen to the extension account which has already been created. Should they be migrated by connecting directly to the subaccounts or would they exist as a subaccount? It should not affect existing extension accounts and there is no need to change anything on it. The above process outlined is only applicable for new extension accounts which need pairing with SuccessFactors tenant using technical on-boarding process.